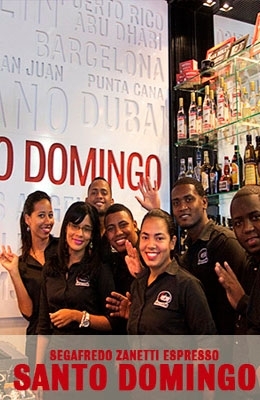 We are proud to announce the reopening of the Segafredo Espresso Cafè Novo-Centro in the Capital of Santo Domingo, in Dominican Republic. Previously known as Segafredo Piantini went under renovation and it was now re-launched with a friendly chic modern atmosphere and re-named as Segafredo Novo-Centro. This Cafè is located in prestigious Novo-Centro building and shopping mall in the heart of the business and high-end residential area of the city. Novo Centro has something for everyone, this shopping mall boasts 18 floors, with a boutique hotel, shops, restaurants, underground parking and a helipad. This mega center guarantees a memorable shopping experience. Among the many premiere restaurants is also Segafredo Espresso Café. We would like to thank our franchise, Caribbean Catering Services Group, for providing high-quality, fresh ingredients and superior customer service that keep our customers coming back for more. We look forward to see their next opening in Miami (USA) in the next months!